to Pandora-style bracelets: A charm bead OR a soldered ring. The Texas charm on the left side of the sample bracelet is soldered onto a charm bead that will slide onto the bracelet. Ellie Lance will solder the charm onto the bead at no charge. You will be prompted in the shopping cart to tell us what charm you would like soldered onto the bead. 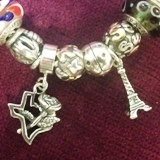 The second option is a large soldered ring like the Eiffel Tower on the sample bracelet above. If that is the option you choose, there is no additional charge. As you order charms, just note in the "ordering instructions" that you would like us to solder a large ring for a Pandora-style bracelet and we will do so before we ship. You may order one of these jump rings per charm. The charm will be soldered on before shipping.